As a new rabbit owner, you will benefit from learning everything you can about your new bunny. The more you understand about your bunny's body and the purpose of her unique features, the more likely you will be able to recognize what is normal for your bunny and what conditions can potentially cause or be a sign of health problems. New bunny owners may be a little bit confused about the extra flap of skin and fatty tissue that is under the chin of their new female bunny. This section of skin is called a dewlap. Male bunnies may also appear to have a dewlap, but it is rarely as pronounced as the dewlap on a female. The dewlap tends to appear when female rabbits have reached the age when they can begin to reproduce. The dewlap provides a place where the female bunny can pull out her own fur and use it to line her nest. The nest is where she will sleep as well as produce and raise her offspring. It is perfectly normal to see a female bunny pulling hair from her dewlap when she is nesting. With that said, your bunny should not pull all the hair out of her dewlap or do significant damage to the skin underneath. If this behavior occurs, then you need to take your bunny to the veterinarian. If a bunny becomes overweight or has a very large dewlap, she may have difficulty eating and grooming herself. Infections can also develop if bacteria or debris become trapped between the folds of the dewlap. Grooming your bunny regularly should help prevent problems from occurring, but in extreme cases your bunny may need to be put on a diet or have surgery to reduce the size of the dewlap. 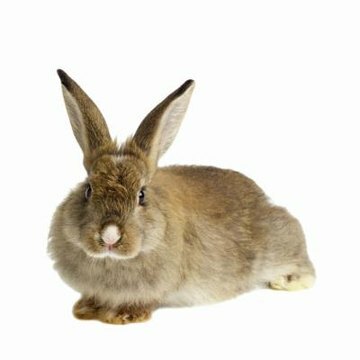 Speak to your veterinarian about any health concerns you have related to your bunny's dewlap. Cottontails Rescue: Keeping Your Rabbit Happy!